Topics: Ac Auto Plex, Vehicle Finder, Finance, Warranty, and Certified Warranty. It is hosted by Theplanet.com Internet Services Inc (Texas, Houston,) using Apache/2 web server. 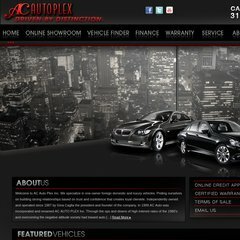 Acautoplex.com's IP address is 174.132.98.124. Its 2 nameservers are ns52.domaincontrol.com, and ns51.domaincontrol.com.